Istria is a beautiful region that draws more tourists than any other part of Croatia. A string of historic coastal towns, rich in archaeological and architectural treasures, sits on this peninsula in the Adriatic. Its rocky beaches and secluded coves are very popular with tourists, and resorts and hotels have sprung up in the area. Two of Istria’s most popular towns are Pula, the region’s economic and cultural centre, and the picturesque fishing village of Rovinj, its centre of tourism. Inland, nearer the region’s administrative centre of Pazin, the bucolic landscape undulates with forest-covered hills, valleys and plains, with the slopes of Ćićarija and Učka mountains guarding the northeast. Medieval villages on hill slopes and old farmhouses in the countryside dot this award-winning wine region. While tourism is largely developed along the indented coastline, the industry is slowly penetrating the mainland. Rural hotels and farm restaurants are becoming popular. Istria was greatly influenced by Italy, its neighbour across the Adriatic. Italian is the region’s second language, and places are often called by their Italian names. Rovinj sits on Istria’s western coast and includes 22 islands in the Adriatic. The city enjoys a pleasant Mediterranean climate, and its coastline is protected by lush forests. Rovinj is an active fishing port and Istria’s most popular tourist attraction, visited during summer by British, Austrian, Germans and Italian tourists. Narrow cobbled streets, piazzas and beautiful Baroque architecture make it delightful to walk through. The Church of St Euphemia with its 60-metre-high tower looms over the old town from the top of a hill. The pedestrian-only main street, Carrera, is lined with art galleries, boutiques, jewellery shops, souvenir stores, cafés, pubs and bars. At night, locals and tourists gravitate to Monvi, an entertainment centre with a club, disco bars, restaurants and an open-air theatre. One day in August, Rovinj celebrates Grisia, an outdoor art exhibition. Paintings done by artists, amateurs and children are put up on the walls and building facades of the street that links the Church of St Euphemia and the main square, where the public may view them. Due to Rovinj’s popularity, many hotels and restaurants have been upgraded to 4-star quality and 5-star hotel complexes are being built. There is a constant increase in private bungalows and apartments. Extensive revitalization of the town has also been carried out, with many old hotels being restored. Pula is Istria’s largest city. Its early history was shaped by the Romans; they built the city’s spectacular Arena, one of the best-preserved of all Roman amphitheatres. It was erected in the 2nd century and still dominates the heart of the city. Summer concerts and other events are held here. Pula is Istria’s busy administrative and economic centre. Its newer sections surround the old town; business offices, agencies and shops reach all the way to the harbour. It has an international airport connected to European cities and its new road network links it more efficiently to other areas in Istria. While there are some restaurants and hotels in the city centre, many of the modern tourist and residential developments are along the indented coastline of pine forests and pebbly beaches. A string of holiday villas and apartments, cafés and restaurants has filled this part of the peninsula. Verudela to the south has several resorts and residential complexes. Medulin Bay is a popular beach resort with water sports facilities and luxury seafront apartments. Not far from mainland Pula is the Brijuni National Park, which covers 14 islands. About 250 bird species and 700 plant species can be found here. Labin sits on a hilltop overlooking the Kvarner coast. It is an old town, with a history harking back to medieval times. A winding network of narrow cobblestone streets leads to a fortress on the highest point in town. Venetian, Gothic and Renaissance churches and palaces stand along the way. Labin was once Istria’s mining capital, but extensive mining caused the hill to collapse. In 1999 mining was stopped and some much-needed repair to the town was made, including the restoration of pastel-coloured houses built during the mining days. The old hilltop town has some places of interest: a central square with the Town Museum housed in a magnificently preserved loggia; the 16th century town gate; and charming terrace cafés, art galleries, and small craft shops. Below the hill is the newer section of Podlabin, or Labin Downtown, where most of the restaurants, bars, shops and services are. 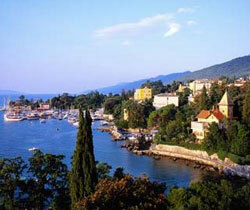 Labin attracts young crowds who are staying in Rabac, the popular beach resort just below it. Rabac, known as the pearl of Kvarner Bay, enjoys a mild Mediterranean climate thanks to the Mt. Učka, which protects it from fierce cold winds. This once humble fishing village turned into a large modern tourist resort when its attractive shoreline was discovered. The first hotel here opened in 1889. The area now is overdeveloped and filled with holiday villas, hotels, apartment buildings and campsites. Private luxury homes have also been squeezed in. Thankfully, Rabac’s coastline and crystal-clear waters are still lovely and well-maintianed. Four of its beaches have been awarded the European Blue Flag label for cleanliness and sustainability. One of these, Girandella, is popular with young people and water sports enthusiasts. It also attracts partygoers during the annual house- and techno-based Rabac Summer Festival. Rabac shares hiking and trekking trails with another tourist destination, Labin, which sits on a hilltop overlooking it. The city of Umag sits on a picturesque bay on the Adriatic coast. A medieval town, it retains the narrow streets and preserves parts of the defensive walls and towers of the Roman settlement it was built on. Renaissance and Baroque churches have also survived, and old houses exhibit the Venetian coat of arms. Umag is a traditional agricultural and wine region, long known for its beauty. In ancient times, Roman aristocrats favoured it as a summer getaway. It was only after the Second World War, however, that tourism started to expand along the coast, following the improvement of infrastructure and the establishment of business and industrial zones. At present, Umag has excellent road and air links to major international cities and towns. And as more visitors flock here on weekends and during summer, high quality hotels, holiday apartments and private bungalows have sprung up. In the middle of the Umag riviera is Lovrečica, a peaceful fishing village with shallow waters, small harbours, and quaint restaurants. New properties are mostly 2-storey houses near the beach. On the northernmost tip of Istria is the summer resort of Savudrija, with the oldest lighthouse on the Adriatic overlooking the sea right by the Slovenian border. Properties here are surrounded by lush Mediterranean vegetation and include villas, apartments and bungalows. Umag is also well known for its Blue Flag-awarded marina and its ATP tennis tournament held on clay.